My recipe changes every time I make it and depends on whatever I have to hand. Drain the liquids from any tins before placing all the ingredients into a large bowl, adjusting quantities to your own preference. There are no rules. Season to taste and mix together carefully. You may want to reserve 2 of the eggs to slice and layer on top as garnish. Cover and chill before serving. 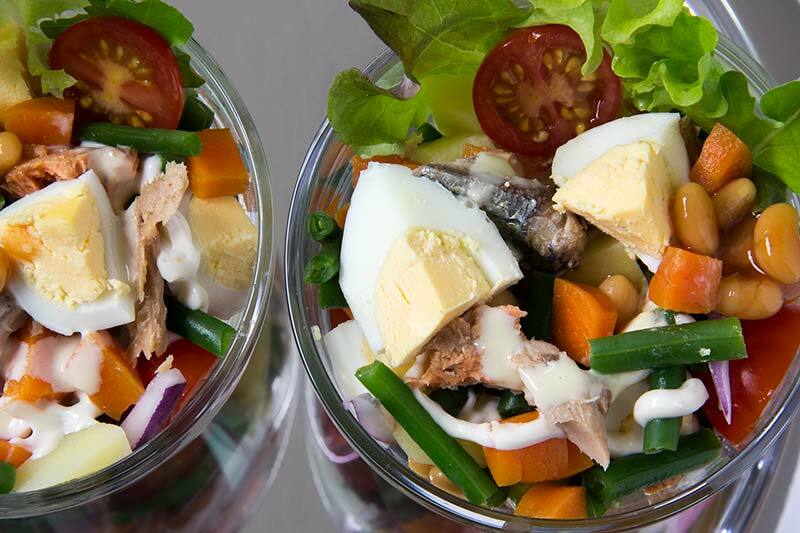 Serve in a large deep glass dish to show off this colourful salad. Or serve individual portions. It should keep in the fridge for up to 2 days. Enjoy with warm bread, French sticks or crusty rolls. This recipe uses mostly tinned ingredients, a throwback from days gone by. There is no reason why you can’t use freshly grilled fish like salmon or tuna and freshly steamed vegetables. Just chill them before mixing. No Replies to "Ghana Salad"